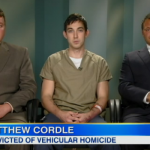 Dan appeared on Good Morning America today to interview and report on Matthew Cordle, who confessed to killing a man while driving drunk in a YouTube video. Yesterday, a judge sentenced him to six and a half years for his actions. Says, Dan: “Cordle initially denied any wrongdoing, but then surprised even his own lawyers with that YouTube confession video. He plead guilty, and yesterday he was in court to learn his sentence… There was almost no reaction from Matthew Cordle after hearing the next six plus years of his life will be spent inside a prison cell. Perhaps that lack of emotion is because Cordle was prepared for what was coming. He effectively turned himself in – and in this candid video confession, he vowed to take full responsibility for what he did. The three and a half minute video, which had been viewed over 2.3 million times, ends with this takeaway message: ‘I’m begging you please don’t drink and drive.’ A lesson that Cordle learned the hard way as he prepared to begin serving his sentence for aggravated vehicular homicide.” For Dan’s interview with Cordle and more, watch the segment here.